A lot of the time, the esoteric wafflings fashion designers lay on the seats at fashion shows are a bunch of gumpf, talking about ideas you can’t see embedded in the clothes, proselytising about the purity of poly-wool and the emotions in cheesecloth. It’s especially evident in the haute couture, where every seam is sewed by hand and so is, genuinely, imbued with human feeling – although, I’d argue, those feelings are often stress, exhaustion, maybe the worker feeling the need to take le break and have le Kit-Kat after hand-stitching seven thousand yards of tulle with silk floss for 400 hours. Was there anything more fantastic and yet, simultaneously, more real than the clothes Pierpaolo Piccioli showed for Valentino? In a series of white carpeted salons in the Hôtel Salomon de Rothschild – a fantastic setting that was once a very real home to that celebrated family (although not its feted couture doyenne la Baronne de Rothschild, Marie-Hélène – Wikipedia it if you’re as fascinated by the minutiae of intergenerational feuds of French aristocracy as I am) – Piccioli presented a collection that transported, plainly. That sounds like more gumpf, but as a statement of what couture can be, perhaps what it should be, it was masterful. 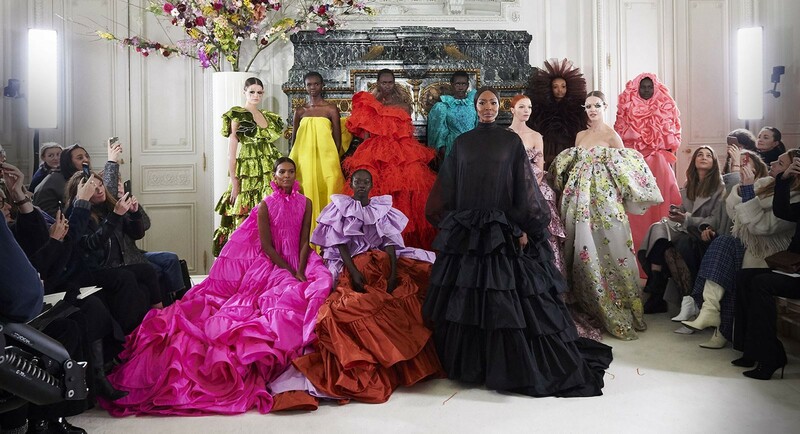 To analyse the above – the language of couture, its overall message, is about perfection, about expense (just as you need a mouth or hands to express language, you need money to talk couture) and, perhaps most of all, intent. It’s about dressing unique individuals, uniquely. The vocabulary – the way it communicates that – was where the reinvention happened: through strident shades of colour; through interesting applications of those techniques; through volumes. That counted slender skirts, cigarette pants, watermelon pink trousers under a narrow ostrich-trained top, as well as the overblown stuff that has made such a literal and ideological impact over the last 12 months. See: Lady Gaga. This collection was inspired, Piccioli said, by flowers. That’s a couture trope. But I think maybe he has fun saying things like that, exploring the mundane and then blowing us away with inventiveness, wit and energy. This show was filled with hothouse blooms, with shades of fuchsia and chrysanthemum pink and grass green and dresses blooming around the body. Piccioli’s casting, filled with strong women of colour, including Liya Kebede and Naomi Campbell, whose widely underrepresented skin tones inspired a different way of looking at colour in the clothes, to complement them, didn’t feel tokenistic or trite. It felt right. True, honest, and above all else plainly beautiful. Which keys it perfectly to Piccioli’s couture as a whole. That shift in vocabulary has been happening at Valentino for a while, since Piccioli decided, somehow, to let rip and indulge us all – his audience, his clients, and most joyously himself – in a riot of unapologetic luxury. 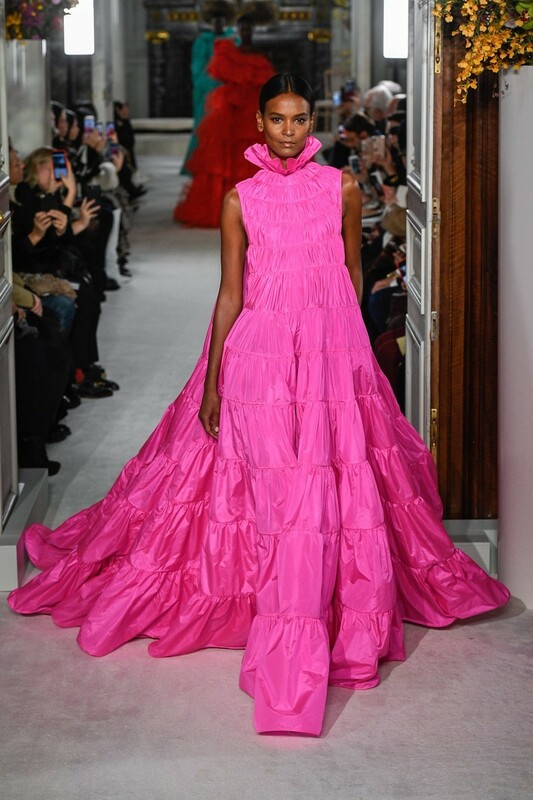 Valentino couture often leaves you breathless, hysterical, giddy. You may easily wake from a slumber three days later, swathed in taffeta with the signed deeds to a second mortgage to finance it. Valentino is a couture bender – you get drunk on the beauty. Most importantly, it makes you dream.